Congratulations, Scott. You should also know that our quality on Marketing Made Simple TV is WAY up, so I am offering past guests like you a chance to come back for a new show, like when you have a new book. Thanks, Jeff! Really enjoyed our show together (although I was fighting off a bit of a cold). Looking forward to seeing the broadcast. This was a great read. I just shared it w/ my colleagues since it touches upon many relevant crossroads for us. Nicely done! Thanks, Jordan — I’m really happy to hear that you’ve found it useful. An excellent read and delivered with trademark Brinker style: thoughtful, well articulated and insightful predictions on trends that seem spot on to me. Congrats on a great book with big implications and a must read not just for CMOs but for VPs, Directors and marketing managers too. Scott, as always, well done! 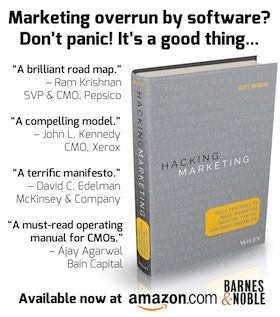 This is a great read for all the folks who are not in marketing – to understand how they should think about, what they should expect from, and what they should provide to marketing to make their company more competitive. Excellent – very comprehensive and fun to read. We just finished up a seminar to investors on this same content. I wish I had read this first.